Potential energy: the energy possessed by a body by virtue of its position relative to others, stresses within itself, electric charge, and other factors. These are some of the very qualities that are required to find solutions for the Grand Challenges for Engineering. Some of the kids were so enthusiastic and inquisitive about what they were learning through KidPower2015, I believe they may be emerging engineers and scientists. Who knows? In the group may be a child who could eventually generate innovative ideas for energy conservation and natural resource management for future generations. The COI kids revealed their compassion as they learned about the life circumstances of the children who attend the Light of Future Schools in Phnom Penh, Cambodia. They were amazed to learn about kids their age who are just now beginning their schools careers, having never been to school before. 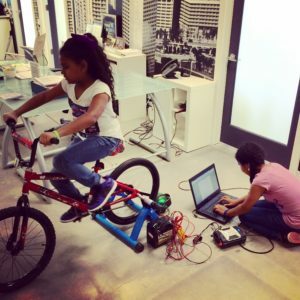 They wondered how many hours a day they would have to pedal the bicycle generator to power a laptop computer at the Light of Future School: “How many kids would have to take turns to pedal the bike to generate electricity for the school? Would they be able to pedal the bike and pay attention in school? Who will buy the bicycle? Do they have a laptop?” Our KidPower2015 Ambassadors, Annabelle and Destiny, wondered how they could help the kids in Cambodia. They were ready to turn their compassion into action. Last week, a friend of mine decided that she would be the donor providing a matching grant. Sally* agreed to match every $100.00 the COI kids raise. The money will be used to purchase bicycles for the school children who need a bicycle to transport themselves to and from school. The KidPower2015 Cambodia Fundraiser will consist of COI kids raising $1.00 for every minute they pledge to ride the KidPower2015 bicycle generators. We hope to raise a total of $300.00 and match that with $300 from Sally. 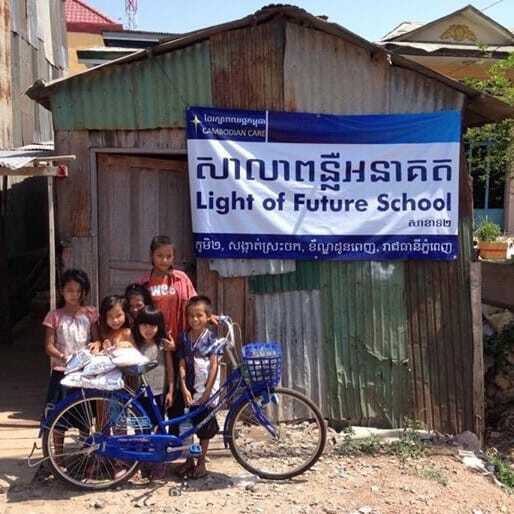 So, when I travel back to Cambodia this summer with the bicycle generators, the COI kids will not only be able to share their KidPower2015 learning experiences via SKYPE, they will also be able to present bicycles to deserving Light of Future School students. How will you commemorate Earth Day, April 22, 2015? All so very awesome! Yay!